What I noticed whilst playing Graveyard Keeper was that a lot of quests are chucked at you early into the game. As you start meeting all the residents of the village, they all start handing you quests which become difficult to track. Especially as you enter the tavern. At some point, you may find yourself with over 10 current quests. It’s a little difficult to find out which one you should prioritise, or where to actually progress with them. Luckily enough, there is a quest log in the game which shows all current active quests. It isn’t very advanced, but certainly does the job. You can find our guide below for viewing active quests. 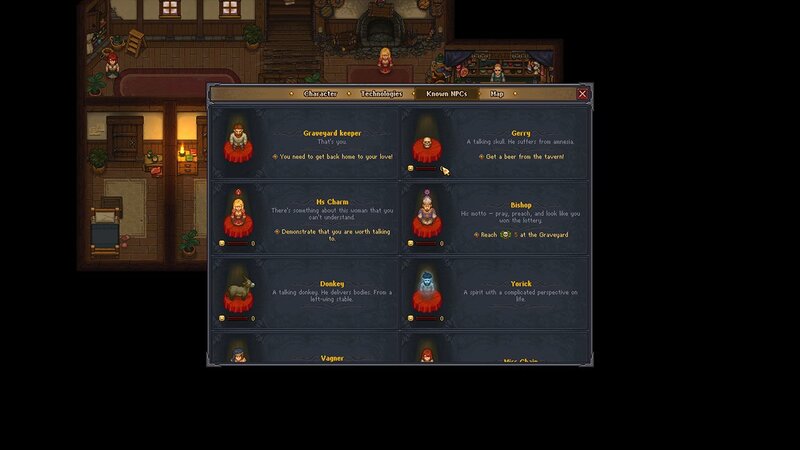 Whilst we have covered a few more guides for Graveyard Keeper, available here. Make sure you in-game, and open up the game menu. Not the one where you change the game settings, but where you can see your inventory, map etc. You can do this by pressing TAB on your keyboard. Head over to the ‘Known NPCs’ tab at the top of the screen. In here, you will find all of the NPCs that you have interacted with in the game. There is a small portrait so that you can re-familiarise yourself. Whilst in boxes next to the portrait, you can see any quests that you have active. Quests are shown as being in a yellow text, with some basic information on what your task is. Unfortunately, it seems there is no setting for seeing more in depth quest information. Although we could see some changes to this in future updates. For now though, this does the job entirely. Once you complete a quest or receive new ones, you will be able to see them on this screen.